So, I’ve had many Press and Media features over the last several years, many of which I didn’t share with you guys. I’d like to fix that by sharing them now. Not all at once. Just here and there. Since it’s the best time of the year for eating pumpkin, let’s start with this feature on Women’s Health Mag for 9 Amazing Pumpkin Recipes. I was so honored to be included in such a wonderful group of bloggers, including my friend Brittany of Eating Bird Food who has a famous healthy homemade pumpkin spice latte that would be perfect on a cool fall day. 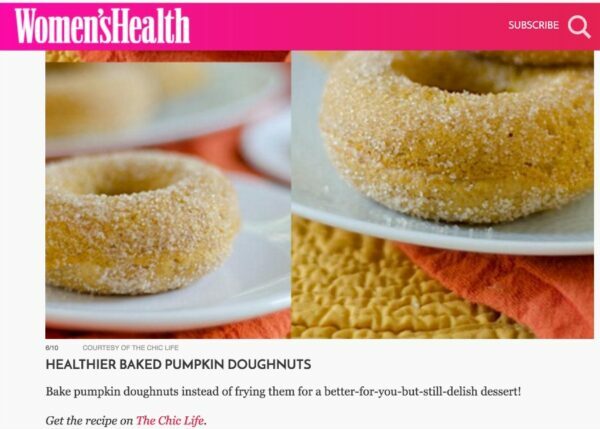 The article also featured my Healthier Baked Pumpkin Doughnuts, which remind me…I really need to whip up a batch soon! Click here for more of my recipes. Thank you, Women’s Health, for the feature! Click here to check out the post. It’s an oldie but a goodie.